Click on the Checklist to see each section in further detail. The complete mock-up of the 2006-07 AADSAS Online Dental Application, previously available to aid your preparation, has been removed in an effort to remain sensitive to ADEA and AADSAS copyrights. Although the American Dental Education Association (ADEA) appreciates the steps that this site has taken to educate potential applicants, it has courteously requested for the application screenshots to be removed to ensure that potential applicants are not viewing outdated versions of the application. 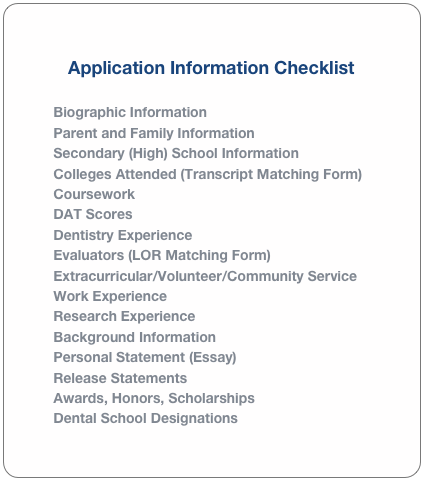 Here you fill find an outline of the salient information that the online AADSAS application asks aspiring dental students. It is recommended that you go through each section individually and prepare a draft of your responses so that when the application is made available by AADSAS, you will be able to submit your information with an early priority enrollment date.